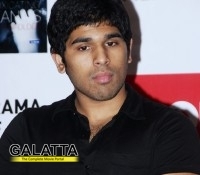 After his elder brother Allu Arjun, producer Allu Aravind's younger son Allu Sirish is also now getting married. The soon-to-be hero will marry a Carnatic and devotional music student Pooja next year. Pooja is the granddaughter of veteran producer-director V.B. Rajendra Prasad, niece of actor Jagapathi Babu and daughter of V. Ram Prasad-Shobha couple. Pooja also a playback singer and she has released a devotional album "Pooja Swaralu" recently. Reports say that both families gave the nod for the Allu Sirish-Pooja wedding and a formal announcement is awaited. Meanwhile, Allu Sirish is now all set to debut as a hero with Gauravam, directed by Radha Mohan and produced by Prakashraj under the banner of Duet Movies. The shooting of this film will commence soon.